You’ve had a brain injury. Not once, when I was concussed, did anyone ever tell me that I had a brain injury. Not when I fell, or got hit, or got tackled, or was in a car accident. The idea that my brain was injured — and I had to take appropriate precautions — never came up. That may be because the idea of brain injury frightens people. They think of brain damage, and that makes them think of stupidity, idiocy, being “retarded”. There’s a lot of stigma around brain damage, so brain injury awareness takes a hit, as well. But if I’d know that my brain was injured, that could have made a difference in how I treated myself. I’ve known for over 30 years that the brain changes — I just needed to know that I needed to take appropriate action to heal. But I didn’t know. So, I didn’t do what was necessary. When the brain is injured, it can release a lot of chemicals that do strange things to the connections that help you think. The connections that help your brain think may have gotten disconnected and information isn’t getting to the right places — like when electrical wires are frayed and not enough electricity gets through. Just like the lights get dim when there’s a brown-out, your brain is having its own brown-out. There may also be a lot of “gunk” in your brain that needs to be cleared out, so that your connections can heal and be repaired. Your brain has changed. The connections that used to get information from one place to the next have changed, and your noggin isn’t processing things as fast as it used to. Your ability to plan and follow through may be affected — you may find pieces of information missing, here and there, and you may not pick up on every detail that you need to make the right decisions. You are probably going to be more distracted than usual. Your brain will get confused and not always know what details it should be paying attention to, or remembering. As a result, you might have more trouble remembering things — especially important things, like dates and schedules and appointments. All of this is going to make you feel very, very tired. You may need to sleep more than usual. Sleep also helps your brain clear out the gunk that gets released when it gets injured. Being tired makes you cranky. It also can make you more emotional than usual. You may find yourself behaving in “strange” ways, or thinking “strange” things. You may also find yourself getting much angrier than before — and much more quickly than before. You might feel like you are crazy… like you’re losing your mind. You’re not. Your brain is just “recalibrating” and figuring out how to do the things it used to do so easily. You may feel like this for a while. The best thing you can do is be patient with yourself and be aware of the ways that you are not functioning as well as you would like. Don’t rush it. These things take time. Eat healthy food, stay away from a lot of junk food, sugar, caffeine, and stress, drink plenty of water, and get lots of good sleep. Plenty of other people have had brain injuries / concussions, and most of them are getting on with their lives. You may notice some changes in your personality and abilities, but some of the changes may be for the better. Be patient. Pay attention. Be the best person you can. This is not the end. Did you know there’s a Kindle eBook version of this post? It’s expanded with all the points I elaborate on, in the individual sections above. It’s such a pity that the “professionals” out there in charge of our care initially are to proud or stubborn to compile the info you have in your last two posts. I’ve taken the liberty of sharing this one and will likely do the same with your last. Keep on keeping on! Thank you Arnie – please do pass it on. The one sure way that everyday people can hope to help others, is to share our own experiences with others who feel alone and are vulnerable in the current “system”. What a succinct and true way of describing this. Thank you! In defense of professionals, sometimes they are unaware of our prior ways of life and if we have no true advocate, it can be very difficult on everybody. In my case, I had been to several different professionals along the way. At each stage, I presented a different personality and/or level of functioning. By the time, I got to the last one, I was very articulate but still unaware. These injuries are very baffling. The survivors distress level may not even show in a consistent way due to what BB outlines here. 10 years post-coma people I knew before my major TBI, would say “when did you get so smart?”. But I felt and I am so dumb in so many ways. The loss of self is still the worst after 25 years. If I have passions, I’m not sure where they are. It is a mystery. Where the passions go, is anybody’s guess. I know I can get very excited about some ideas, but it never lasts. And in the end, I often wind up just feeling neutral about everything. It’s not terrible, it’s just strange. Again, My unrecognized thoughts are found in your expression. I feel very neutral about everything. TBI leaves us there somehow- in the beginning and then again later. This time it feels less apathetic, given time passed from last TBI, but there is nobody to blame. We must learn to be content on some level of where the TBI leaves us. Everyone has to, on some level. I resemble those remarks. ;)) Awesome list!! Summed up well! Thank you for your clarity and sharing. Many blessings. Thanks for writing – it’s certainly not easy, but I’m glad you’re living your life. Have a great day. I was thrilled to discover your sight. Over the last 6 months, I’ve spent hundreds of hours searching for help. I’ve felt like nobody understood me or my problems; and I couldn’t find information on things that might help – like gist reasoning training. AND I was so confused from the brain damage caused by encephalitis that I had a terrible time understanding what I read. Then you came alone and cleared up so much of my fog. Thank you for this site! Thanks for your kind words! I’m glad you found your way here, and that you have gotten some help from this! I hope you continue to benefit from this, and I wish you all the best in your continued recovery! I’ve had two concussions. I’ve always wondered if my poor memory is due to this, or if its just how busy I am with two children. Could be a combination. 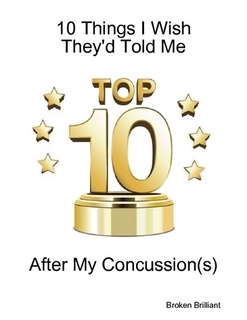 One of the prominent effects of mild TBI / concussion is that your brain gets tired more easily. Of course it does! It has to process information on “secondary roads” in your brain’s wiring, rather than using the “beltway” that you used to use. And a tired brain can have difficulty with memory. Stickie notes are plastered in many places around my house, to help me remember things. If my spouse doesn’t “keep on me” about things, they just fly from my brain. If I don’t adapt (like I know I should), things get complicated. Very complicated… and worse. Of course, being busy with 2 kids will use up more of your energy, so you’re using up a lot of your available brain energy on them, which cuts into your other resources. Systems like keeping lists and having a strict routine to get through each day help me make the most of my time and not expend a lot of energy on trying to figure everything out as I go along. Good luck to you. Get good rest, eat right, and try to get some regular exercise. Those all help for me — immensely. The link will not work. Thank you! You seem to know a lot about it. Linked this oldie but goodie again to a tongue in cheek Halloween post “from” my dog – in a quick aside about the dangers of football and head injuries. [“THIS will REALLY Scare you!”] Check it out when you need a giggle. I hope at least SOME people click the link – this is (and will remain) good stuff. Ah, thanks – yes, let’s hope so. Awesome list, dude ❤ This helped me understand my parents (both have TBIs from a car wreck) a lot more – it explained why they act certain ways sometimes, and it helped me to understand what's behind it 🙂 Thank you for this!! Thanks for writing. Glad you enjoyed it. I’m expanding on the points to make things more clear – and publishing it in print later this year. The TBI recovery space is in dire need of disruption, and getting the right information (not outdated misconceptions) is the first step. Yes, I think so, too. I don’t see a whole lot of difference between ABI and TBI, when it comes to how it affects us in the long run. And anyway, any brain injury is traumatic, so the distinctions aren’t always useful. But I need to make them, for the sake of clarity — and also because this is the viewpoint I’m working from. Previous Previous post: Week “off”. Nice.